Nataraj creates a wonderful musical journey with lovely melodies and trancelike rhythms from Africa and the African diaspora. Our music is sophisticated and virtuoso. We can bring full percussion and get people dancing, or we can tone down and provide relaxing or even meditative music, depending on the specific needs of your party or event. Please listen to the tracks on this webpage to get an idea of our sound. 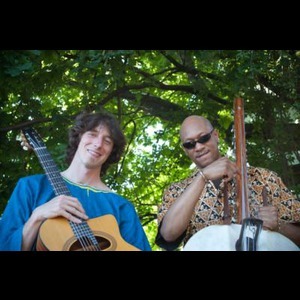 The group features the acoustic guitar of Nicco Tyson, who has studied in West Africa and Brazil, and multi-instrumentalist Keenan Webster, who plays the kora (African harp), as well as percussion and flutes. Zori Marinova brings her virtuoso conga playing from the Afro-Cuban tradition and Amber McZeal of New Orleans provides soothing and soulful vocals. We perform at private parties, ceremonies, and events around the Bay Area. Past performances have included the INTA Conference in San Francisco, the San Ramon Tree Lighting Ceremony, Little Boabab Restuarant, as well as private weddings and corporate functions. 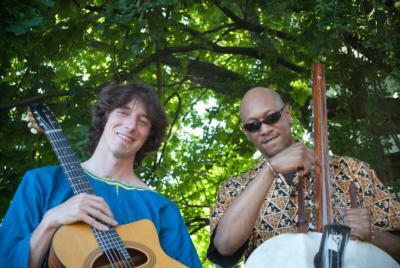 Our music is rooted in African traditions, but we also perform versions of standards and popular tunes. Some of our favorites are Pachelbel Canon, Green Sleeves, Afro-blue, Manha de Carnaval, and Summer Time, but don't hesitate to ask if you have any special requests for us. 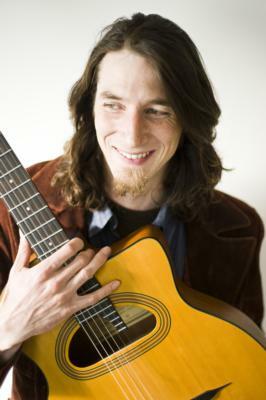 Nicco Tyson (guitar) and Keenan Webster (kora) are also both available as solo performers or as a duet, just let us know exactly what you are looking for in terms of an instrumental or vocal performance. We were very impressed with each of the Nataraj band members. Nicco and crew came early and prepared to delight our guests with music. We had countless guests approach us during and after the event about how much they enjoyed the unique sounds. Nataraj was able to determine the correct music to play and at the most appropriate level. They were very professional, curteous and very accomodating. I highly recommend Nataraj. Joe M.
Please note Nataraj will also travel to South San Francisco, Belmont, Daly City, Brisbane, Oakland, Sausalito, Alameda, Emeryville, Tiburon, Berkeley, San Bruno, Albany, Mill Valley, Pacifica, Piedmont, Richmond, Corte Madera, El Cerrito, Larkspur, Millbrae, San Quentin, Tamal, Burlingame, San Rafael, Canyon, El Sobrante, Greenbrae, Orinda, San Leandro, San Mateo.